Konidela Kalyan Babu, known by his famous name Pawan Kalyan in South Indian Movies, who was born on 2 September 1971 (age 46) in Bapatla, district Guntur, Andhra Pradesh, Indian. 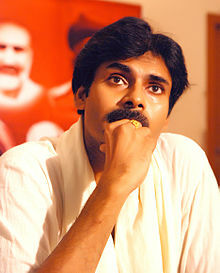 Pawan Kalyan is famous by these name also PSPK, Power Star Pawan Kalyan in South industry (Telugu Cinema). Pawan Kalyan’s father name is Konidela Venkat Rao and mother name is Anjana Devi, he is a younger brother of famous Telugu actor Chiranjeevi. Pawan kalyan married 3 times to Nandini from 1997 to 2007, to Renu Desai from 2009 to 2012 and to Anna Lezhneva since 2013. Pawan Kalyan has a son Akira, and a daughter Aadhya, with Renu Desai. Pawan Kalyan started his career with the 1996 film Akkada Ammayi Ikkada Abbayi as Kalyan Kumar than he did second movie Gokulamlo Seetha in 1997, which was a remake of the 1996 Tamil film Gokulathil Seethai. Pawan Kalyan entered in politics and founded a political party named Jana Sena on 14 March 2014, He also wrote a Book Named Ism. He met withPrime Minister Mr Narendra Modi to discuss the issues related to the Telugu states. We have done our best to inform you about Pawan Kalyan, but if you have any correction please write us in comment section.